Hacker’s Pub and Grill made its debut on April 1, 2011 on the first floor of the Middletown Country Club clubhouse as part of an extensive renovation project which included a brand new golf shop, outdoor ground level patio, and second-floor deck overlooking the practice green and golf course. Reviews of the new facility were instantly positive after several years of the former bar and grill. Hacker’s now offers a hand made horseshoe-shaped bar that can seat 25 guests comfortably with no obstruction. Hacker’s is now the perfect place to catch all of the Phillies, Eagles, NCAA college football/basketball, Flyers, 76’ers, and of course, the PGA Tour on five new flatscreen plasma televisions. Up to six beers are now on tap, including your favorite domestic and imported beers along with seasonal microbrews. 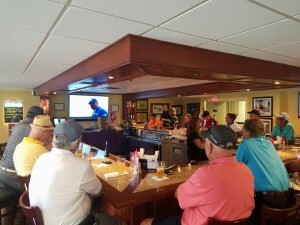 Even more beer selections are available in bottles, along with the mixed drink that you desire while you are collecting on a golf bet or lamenting that 3-putt on number 18. Hacker’s menu includes such selections as traditional Philly cheesesteaks, Angus burgers, wings, onion strings, cheesesteak nachos, our signature Hacker’s Salads, and much, much more. Along with the golf course, Hacker’s Pub and Grill is always open to the public. Our intimate atmosphere is perfect for a lunch break, a post-round sandwich and beverage, a casual meeting place for friends, or a friendly shuffleboard match.